Postać - Leader - Gungan. Punkty: 9/12. Wytrzymałość: 9. 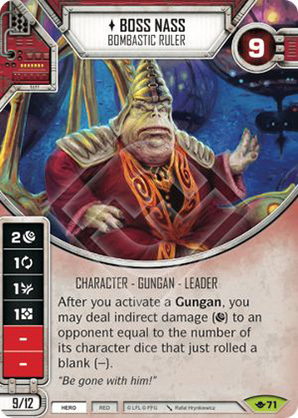 After you activate a Gungan, you may deal indirect damage () to an opponent equal to the number of its character dice that just rolled a blank (). Way of the Force #71.